FILE - A clerk counts 100 Chinese yuan banknotes at a branch of China Merchants Bank in Hefei, Anhui province April 20, 2015. The surprise devaluation of China's currency Tuesday, prompting its biggest single-day drop in a decade, has created a ripple effect through commodities, as well as currencies and stock prices in Asian emerging markets. After falling 2 percent Tuesday, the yuan's market rate fell another 1.6 percent Wednesday. Commodities indexes also declined Wednesday, trading at levels not seen since 2003. Broad indexes of Asian stocks, excluding the Japan market, fell 2 percent, plunging to a two-year low. ​A day after the yuan's trading band was loosened, resulting in about a 5 percent slide of the currency in global trading, Vietnam followed suit and widened the trading band around the dong. Vietnam's move means "a currency war started almost immediately," said Marshall Gittler, head of Global FX Strategy at IronFX, based in Cyprus. Other Asian governments may also be tempted to weaken their currencies to make their goods more attractive. “If Thailand, Indonesia, Malaysia, Vietnam all decided they were going to win or gain market share by making their currencies significantly cheaper, then it's the averages citizens who pay the cost of that policy decision because they pay more for imported goods,” said Glenn Maguire, chief Asia-Pacific economist at ANZ Bank. And that added cost to citizens is why many economists, such as Maguire, do not anticipate a currency war in Asia. In Wednesday currency trading, described as “very jittery” by some traders, Malaysia's ringgit and Indonesia's rupiah were at 17-year lows against the U.S. dollar. The Australian and New Zealand dollars fell to six-year lows. The Chinese central bank's decision to allow the yuan, also known as the renminbi, to significantly weaken is viewed by some analysts as a way for Beijing to export its problems to the rest of the world. China has been criticized for keeping its currency undervalued to make its exports more competitive. A customer counts Chinese Yuan notes at a market in Beijing, Aug. 12, 2015. “Greater exchange rate flexibility is important for China as it strives to give market forces a decisive role in the economy and is rapidly integrating into global financial markets,” an IMF spokesman said in a statement. 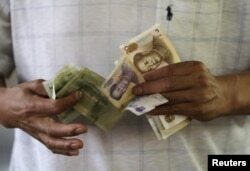 China desires the yuan to be included in the International Monetary Fund's basket of traded currencies. Thus a move to allow it to fluctuate more freely will likely be seen favorably by the IMF ahead of its decision next year on the yuan. Worried consumers in Asia watching the currency market gyrations need to bear in mind that there are really two economies in China – one consuming goods from other Asian countries and China as an assembler of goods with parts coming from other Asian countries. Noting past trends “the adjustment of the renminbi, especially downward adjustments will have a stimulating effect on exports,” Zhang Yuzhong, deputy director of the China commerce ministry's investment promotion agency, told reporters in Beijing on Wednesday.